Teeth that didn't hurt yesterday can suddenly become very painful and this condition is extremely dangerous to your health and well-being! Our express forms are easy to fill out and most of the information we request is quick and simple. We have bilingual forms and a staff that will gladly help you get to see the dentist as fast and painless as possible. We even fill out all your insurance forms for your convenience. We make the paperwork simple, easy to understand and straightforward. 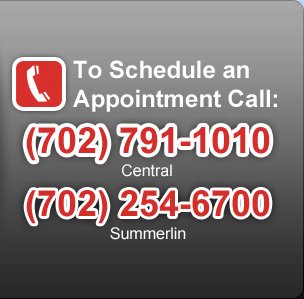 To Schedule an Appointment Call"
The Doctors and staff at Moore Family Dentistry wish to welcome you as a new, or even returning patient. We provide emergency care for toothaches today as well as all phases of Dentistry. Please don't live in fear or constant pain as we can help you. We have decades of combined experience and have cosmetic, comfortable and affordable choices for your dental problems. Broken tooth or broken teeth, broken dentures, or just about anything broken in your mouth we can help you with here in Las Vegas.Many of the dental problems that you are facing are likely covered by your insurance, and if you don't have insurance our affordable fees will be agreeable to even those on the strictest budget. We even have payment plans available, so there's no excuse to delay the work you know you need any further! For instance, a broken tooth or bleeding gums today can turn into a life threatening problem tomorrow. Lost/missing teeth, or loose and uncomfortable dentures can be treated with our experience in affordable and reasonably priced dental implants. Sometimes a tooth that "feels" fine can suddenly turn into a nightmare and we are here to help. Many good people think that the condition of their teeth is beyond hope and are too embarrassed to make an appointment out of fear or hoplessness. We are here to assure you that we have not met a patient yet, with all our years of experience, that can't be helped. In fact, we're so sure that we can assist you that we even provide a Dental Warranty for services we provide (ask the staff about this Moore Family Dentistry one of a kind "trade mark"). Why go on with the problems that you know you are having and avoid the hassles and grief of tooth or gum problems by calling today. These problems (as well as many others) are something that can be avoided further if you just call and ask to speak with one of our excellent staff today. Help really is just a phone call away! Here at Moore Family Dentistry, we offer many levels of sedation to make dental treatment as comfortable as possible. By combining our experience with treating people from all walks of life, we can offer all levels of fear reduction by helping you decide on what is best for you. We understand that we live in tough financial times here in Las Vegas. Our fees haven't gone up in several years, because we live here too and realize just how many hard working people we serve-something we're kind of proud of honestly. Please feel free to visit one of our many websites to look over some of the special features that we offer here in Las Vegas. We are dedicated to being the home of "where smiles are born"
© Copyright 2015 Moore Family Dentistry. All Rights Reserved.